Staying cool in the summer can be a real challenge, especially when you wear hijab. Thankfully there are several things you can do to avoid getting too hot. But firstly, I think it's important to remember that everyone feels the heat in summer, no matter what they're wearing. In fact, you'll actually feel a lot cooler if your skin is covered up from the direct sunlight, as well as protecting yourself from sunburn. My favourite garment to wear here in Lebanon is a white linen skirt. Lighter colours reflect sunlight so that you hardly feel the heat; white is easily paired with any other colour, but also looks great on it's own! 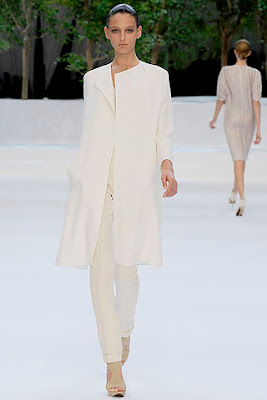 Designers have come up with many all-white looks, including maxi dresses for day and evening, and trouser suits with long jackets. I particularly like the tiered jacket by Aquascutum. More summer style tips to come soon! 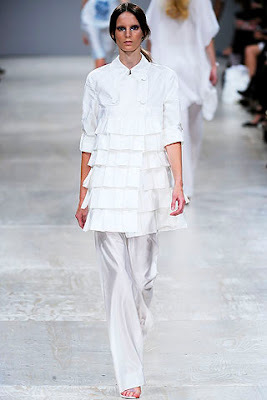 I liked the white maxi dress by Ruffian, so chic! I hate strapless, but I still love the second dress. I love the way it falls and it looks so soft! I totally agree with remembering that everyone's feeling the heat - every time someone asks if I'm really hot in my hijab, I'm like "of course I'm hot, it's a sunny day, aren't you?" While it's true everyone feels the heat during summer, for me personally pashminas and crepe/polyester hijaabs don't mix with summer heat. Does anyone know where to find fashionable cotton or linen hijaabs online? I find that white make's ppl look beautiful. lolllll. I really do! It is such a simple and pure colour. Suits everyone. As for the heat, it is best to wear long dresses, skirts or abayas because it lets a lot of air through the bottom. The more loose the clothing is, the more cooler one will feel. I think you're right - if I'd been in a white cotton hijab with a light skirt underneath, it would have been a lot cooler than the black polyester one with jeans!